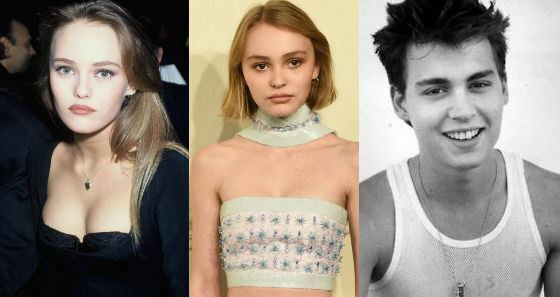 The daughter of Johnny Depp and Vanessa Paradis, Lily-Rose Depp continues to conquer the fashion industry and seems to edge out Kendall Jenner and Gigi Hadid. A few hours ago, a girl has posted a picture from her new shoot for Italian Vogue, specifically for which she showed off her upper body. Users, as usual, divided into two camps: some admire the boldness of the beginning model, and others considered it awkward. "I hope this shooting will not be available in France. A shame!" "She's 16! Not even 18! Are you aware that this is ground for criminal prosecution?" "Oh my God, another Miley Cyrus!" "Beautiful Lily-Rose! Guys, she can do anything. This is her body". "People who ask questions about the reaction of her parents, I want to remind you that her mother appeared naked in a French film". The shooting is devoted to the Chanel advertising campaign, the cooperation with which Lily-Rose began the year before, having become the ambassador of the collection of accessories and perfume. Heiress of Hollywood actor Johnny Depp and French singer Vanessa Paradis confidently reaches new career heights: Lily-Rose is the face of Chanel, appearing at fashion shows and posing for advertising. There are new works added to the portfolio of the daughter of the star "Pirates of the Caribbean": the girl decided to get undressed for the Italian"Vogue". She wears only a classical pearls from Chanel. Lily-Rose shared picture, which immediately caused a storm of indignation in social networks: a girl is a minor! "She's only 17, this is against the law", "I hope the shooting will not be seen in France. It's a shame ","I wonder what her father said about the photo? "- wrote indignant users in social networks. There are many who are sure: Lily-Rose, as the role model of her generation, is a bad example for peers. Many, however, believe that the photographs turned out to be quite chaste: a beautiful girl, a breast is covered, no vulgarity. "This is her body, pretty and beautiful, and Lily-Rose can do what she wants," - wrote the fans of the young star. Lily Rose is the favorite model of the creative director of Chanel fashion house Karl Lagerfeld. The couturier entrusted Lily-Rose with the honor of being the "face" of the main treasure of the brand - the legendary perfume "Chanel No. 5", and also invites her to every show of the next collection. At one of the defile the girl walked down the runway with her mother Vanessa Paradis. Although the young girl has all the data to become a professional model, Lily-Rose is not eager to make a model career. The girl is much more interested in movies. Recently she starred in "Planetarium" movie with Natalie Portman, as well as in the historical melodrama "Dancer", in which she played the young Isadora Duncan. Lily Rose admits that she is not attracted to the singer's career, like her mother - she wants to act in films like her father. "My parents have always tried to keep me away from the center of attention, for which I am very grateful," - Depp's daughter told. - They generally tried to protect me from the cinema, because this is a very cruel business. But when they saw that the actor's work gives me joy, they calmed down. Now I hear from them what all parents say to their children: "Do the best you can", "We are proud of you".